After a seven-year break of revisionist genre pictures (Dead Man , Ghost Dog ) and an ongoing sketch show (Coffee and Cigarettes ), Jarmusch has returned to where he began: the aimlessly-winding-character-picture-in-which-not-much- happens. And, although all his recent pictures have been interesting and enjoyable without fail, it’s great to have him back. 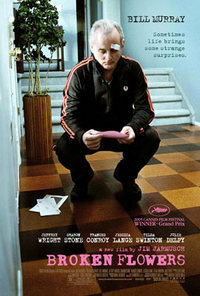 Broken Flowers is about Don Johnston (Bill Murray), an ageing Cassonova and sardonic depressive. When we meet Don he is being left by his most recent younger girlfriend; he sort of wishes she wasn’t doing it, but he’s not going to go too far out of his way to save the relationship or himself. When a mysterious anonymous letter claiming to be from a former lover arrives and informs him that he has a teenage son, he is faced with a potentially life-changing situation that he’s not quite sure he wants to confront. The road movie structure that Jarmusch used to such superb and melancholy effect with Stranger Than Paradise (1984) then comes into play, as Don embarks on a trip to visit all the girlfriends from the appropriate time period in an attempt to track down the one who wrote to him. This allows us to be introduced to an episodic line-up of characters - to eavesdrop on a number of different lives in exactly the same way as Don is doing. We feel the vast gulf between the past and the present - the things that might have been, the things that change with time and responsibility - which Don has somehow managed to avoid by staying at a remove from life. Instead of being one of Jarmusch’s foreigners in a strange place, Don is out of his element in a more figurative way: he is a loner floating across an America of couples, families, connectedness. This detachment is where the film gets much of its comedy (and Murray’s deadpan brilliance has not been this good since Rushmore ), but is also where it mines for true emotion. Both are gained beautifully easily by the film (though if it were not for the character of Don’s friend, Winston [the outstanding Jeffrey Wright], it might - perhaps surprisingly - have been weighted too much on the side of the latter). My only real problem with Broken Flowers was the sense of déjà vu I felt at a number of points during it. This troubled me until I stopped to remind myself that this was probably because the recent films it is similar to have all been inspired by the work of its director. Two that immediately and obviously sprung to mind were the two using its star: Lost in Translation (2003) and The Life Aquatic With Steve Zissou (2005) - the first sharing a similar vibe of silent, detached suffering, the second closely mirroring the plot set-up. Jarmusch’s particular style of sad oddness can be seen to have been run-with by these films’ directors, and in the process has been made slightly more approachable: Coppola has reigned-in the strangeness to the point of conventional drama, Anderson has heightened it to the point of whimsy. Even though the familiarity bred in Broken Flowers by the rise of these kinds of films is undeniable (and even though I admire the mentioned films in a number of ways) I would still finally take the originator’s work over them any day. There’s just a confident mastery of tone here that reflects the years of experience Jarmusch has with such material. Even the potentially unpleasant air of chauvinist male fantasy, inherent in a story of a man being able to pass ghost-like through a host of past lovers and still be found attractive by them all, is offset by the encounter with the pet-therapist ex and her secretary. By the time Don’s journey ends, the film has accomplished the feat that so many films strive for but few achieve: it has made us truly care for the cynical loser. Possible reasons for this are explored in the Alternate Take - for now, suffice to say that the film is a warm, quiet, unassuming, funny and moving pleasure. This review was published on September 01, 2005.